Position the hold down anywhere you can supply a 3/4" hole. 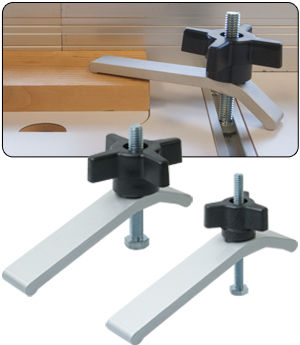 The wedge mount allows you to tighten the hold own into the mounting hole when the thickness of the mounting surface is 1" and thicker, which is perfect for most workbenches. 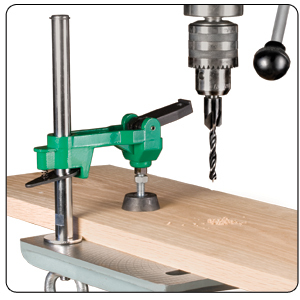 For surfaces like standard drill press tables, remove the wedge mounts and tighten into position with ring nut. Either mounting method provides a secure mount to hold any material in place. Fits 3/8" or larger through slots or holes. Can be used on Workbenches. Rubber Clamps Foot prevents marring. Hold Down Capacity of 4-3/4"
Note: This can only be used on drill press tables with thru holes or thru slots and work benches with 3/4" holes. The post quickly mounts to most drill press tables. On the drill press a bolt passes through the table and is secured with a large ring nut. Hold down pressure is provided by the cam action clamp on the head which features a 1-1/2" dia. rubber foot to help prevent marring your work piece. Hold Down Fits 3/8" or larger through slots or holes. Note: This can only be used on drill press tables with thru holes or thru slots. 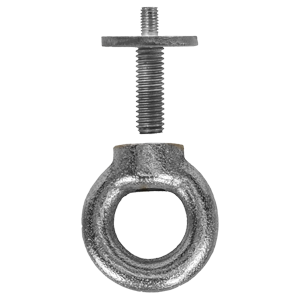 These t-track hold down clamps are designed to work with our T-Track opening for either 3/8" or 1/4" sizes. The bottom of the clamp slides neatly into your t-track slot, and is adjustable to anywhere along the track. The clamp is fitted with a 2-3/8” brass foot for excellent holding power. The clamping capacity is approx. 2-1/8”. This package is available in packs of two in 1/4” or 3/8" sizes. Note: T-Track & Drill Press Table not Included. Bench Klamp to most any drill press table. The adapter fits into most through slots on drill press tables to allow the top thread to protrude through the top of your drill press table. 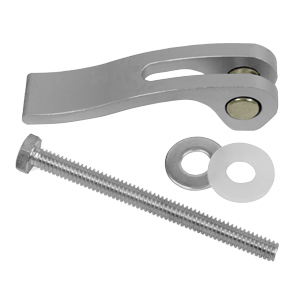 This allows you to quickly attach and remove your Kreg Bench Klamp as needed. Perfect for holding down large a small pieces of stock on your drill press table. The Drill Press Adapter is available individually or may be purchased with a 3” or 6” Kreg Bench Klamp™. Fits tables with 1/2” wide slots. This Drill Press Clamp adjusts quickly and easily to lock your work piece in any position. 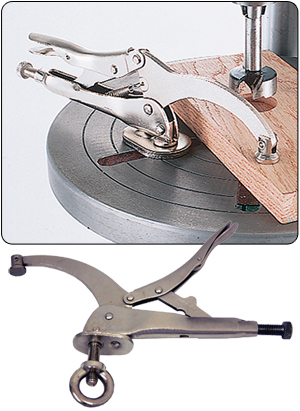 The clamping pad pivots to conform to any work piece, ensuring uniform pressure. Table top must have hole through slots in order for clamp to. The Clamp are like vise grips, so it insures that when applied that the grip is secure. Spending a lot of time tightening and loosening knobs on your jigs and fixtures? 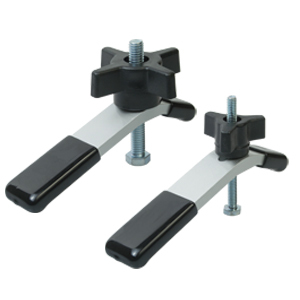 Our exclusive cam clamps will solve your problem and give you a quick release for all of your jigs and fixtures. Cam clamps come with a standard 3” long hex head bolt that works with our T-track, or you can swap it with a bolt from one of your own jigs. Each cam will exert up to 400 pounds, depending on how you set it. 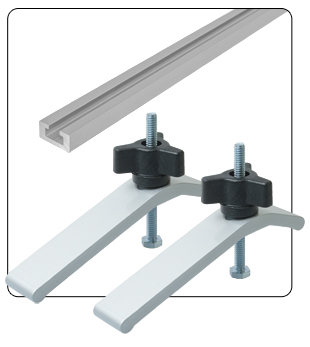 The Hold Down Clamp slides in the T-Track and quickly secures with the turn of the knob. 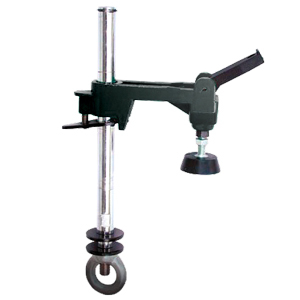 By turning the clamp head 180° to the work piece, the clamp offers a dual capacity of 0" to 2” on one side and 0” to 3” on the other side. Once the track is installed on your router table or drill press table, you can utilize these hold downs for maximum holding pressure. 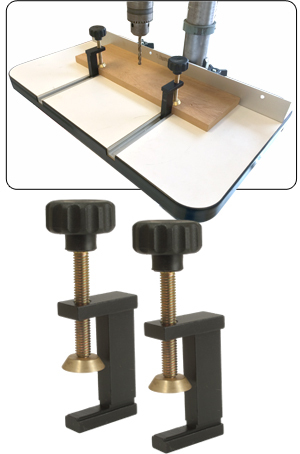 These packages include the Aluminum Hold Downs and the T-Track for installing on your drill press table, router table, workbench or any work surface you desire. These PVC Tipped Hold-Down Clamps feature non-marring PVC tips that are the perfect tool for working with softer woods, finished surfaces or for any stock that needs to kept in place. The PVC also gives you more gripping power when pressure is applied to your stock. This prevents slipping and walking of your wood especially when drilling on a drill press. Our PVC tipped hold downs come with a star knob and bolt and are available in the two most commonly used sizes of 1/4" x 20 and 3/8 x 16.